If you are interested in becoming a sponsor of Money Laundering in Canada 2019, download the sponsor information package to view the available options. If you have additional questions, please contact us. ABCsolutions’ annual conference promises to be informative and pragmatic, looking at trending crimes, risks, compliance practices, and regulatory change. For 2019, we have consulted various experts to identify compliance management topics that create challenges in their interpretation and/or application. Others will speak to money laundering topics and trends they are currently examining, identifying associated threats and red flags that can be used by reporting entities and regulators alike to manage the risks. Common compliance program practices will be compared to regulatory standards to identify application limitations that could result in a deficiency ruling during an effectiveness examination. And more! Make sure you join our mailing list or follow us on Twitter and LinkedIn to receive the latest updates. Money Laundering in Canada has been competitively priced, with additional savings for early bird registrations, multiple registrations from the same organization, and members of the Canadian Anti-Money Laundering Institute (CAMLI). Space for Money Laundering in Canada 2019 is limited. 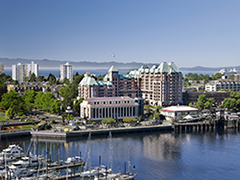 Make sure to register early to secure your spot in Victoria.